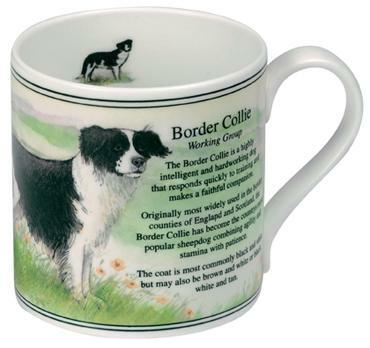 Border Collie Bone China Mug. The Border Collie is a highly intelligent and hard working dog that responds quickly to training and makes a faithful companion. Originally most widely used in the northern counties of England and Scotland, the Border Collie has become the countrys most popular sheepdog, combining agility and stamina with patience. The coat is most commonly black and white, but may also be brown and white, or black, white and tan.